An MSP N-central deployment includes three primary components: theMSP N-central server, Windows probes, and agents. 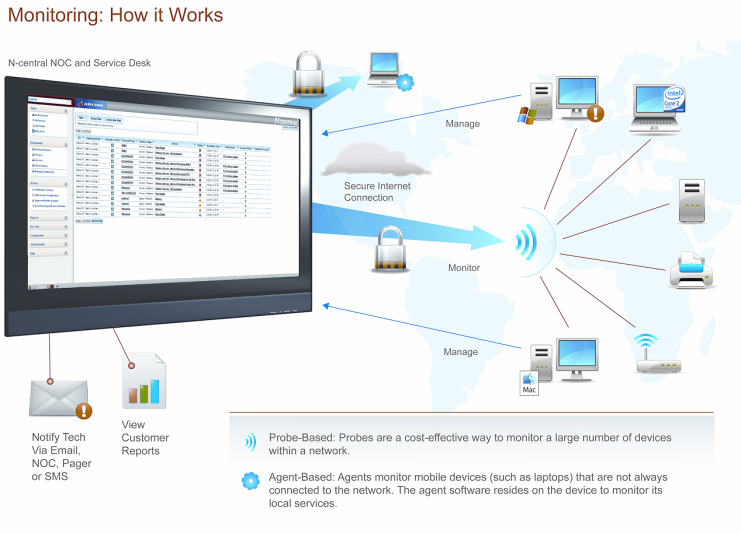 Agents monitor local services on devices, including Windows, Mac OS X, and Red Hat Linux. The figure below depicts an MSP N-central deployment and the flow of communication from the Agents and Probes to the MSP N-central server. Communication is always initiated from the Agents or Probes to the server. By default, this communication uses port 443 (HTTPS). This behavior ensures that the data being sent to is encrypted and that no modifications to the customer’s firewall rules are needed in order for the Agents and Probes to successfully communicate with the server.